How can previous cross-border-cooperation projects on MSP or MSP-related aspects be capitalized? How can capitalization be used to elaborate a feasibility study on DSS for MSP? The “Feasibility study for the Adriatic plus Decision Support System (DSS) for the adoption of measures to mitigate threats to the marine and coastal biodiversity” was developed within the project Adriatic plus “Sharing marine and coastal cross management experiences in the Adriatic basin” funded by the IPA Adriatic Cross-border Cooperation 2007-2013. The project Adriatic plus, stemming from the results of three IPA ordinary projects (NETCET, SHAPE, HAZADR) and two IPA Strategic Projects (BALMAS, DEFISHGEAR), promoted the sharing of marine and coastal management experiences in the Adriatic basin in order to foster the definition of a coherent and systematic planning and to contribute to the achievement of EUSAIR objectives, in particular related to Pillars 1 (Blue growth), 3 (Environmental quality) and 4 (Sustainable tourism). 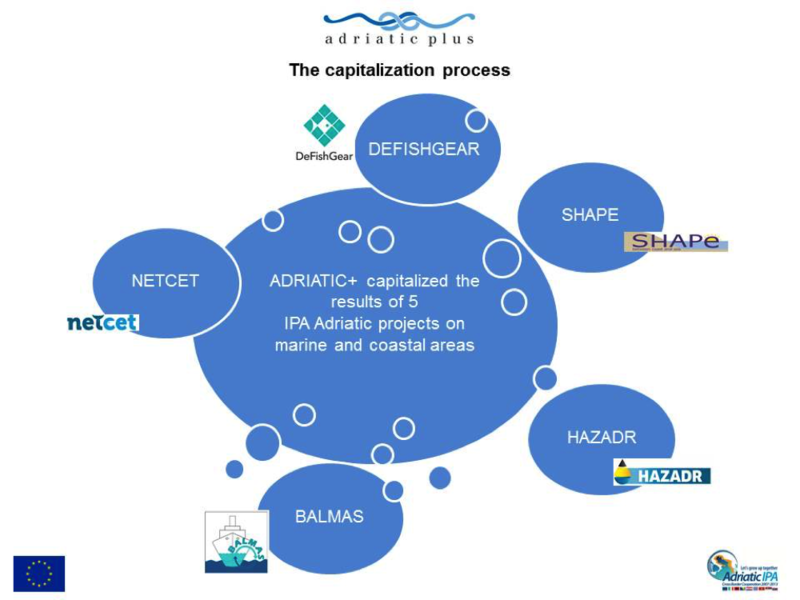 Thanks to the sharing of expertise, tools and data gathered within capitalized IPA projects, the project contributed also to the establishment of a scientific and technical network among relevant organizations and experts in the Adriatic enhancing also linkages with similar EU networks and projects in the Mediterranean Sea. Within the framework provided by EUSAIR Action Plan, the feasibility study aims to underpin the set up a Decision Support System (DSS) for the adoption of measures to mitigate threats to the marine and coastal biodiversity in the Adriatic and Ionian Region. The feasibility study is the result of the joint effort of Adriatic plus partners and it is based on the outcome of the above mentioned IPA projects. The feasibility study recognises that MSP is inevitable in the Adriatic Ionian Region. While the biodiversity conservation and environmental protection agenda, recognised by the five capitalised projects, is an essential part of planning when policy decisions are made about the spatial and temporal use of the region, the aim of MSP must be to create sustainable and synergistic development for cooperation between sectors and different governance institutions. The feasibility study is structure into four main chapters. The first one introduces the context of the Adriatic plus project. The second chapter reviews the basis of decision making and the literature available on the DSSs for MSP, focusing on the available data for the Adriatic Sea including summaries of the 5 capitalised projects. The third chapter examines consistencies between the project and the EUSAIR macro-regional objectives and draws on interactions and information provided by Adriatic plus focus meetings, an international workshop looking at the role of the Decision Support Tool ‘Marxan’ in multi-objective MSP in the Adriatic organised in September 2016 and other presentations undertaken within the project. The final chapter identifies areas where information is lacking and provides a summary road map for the future definition of a DSS-MSP system for the Adriatic Ionian Region. Funding Source: the feasibility study was developed within the Adriatic plus project, funded by the IPA Adriatic Cross-border Cooperation 2007-2013.